The goal at Rockland Community College over the last decade has been to create a student-centered environment that meets the needs of students and enhances their chances for success. It started with creating The Center for Excellence in Teaching and Learning (CETL) to provide faculty with access to professional development and hands-on experience with the latest technology. Excellence in teaching has been a hallmark of Rockland Community College since its founding more than 50 years ago. Then came our Title III grant, which focused on strengthening support services for students. It enabled students to sign up online for one-on-one personal tutoring in all disciplines. Disability Services became Accessibility Services to meet the special needs of all students. RCC also expanded its veterans program and created a special Veterans Lounge where veterans can support one another. Financial Aid services have expanded, and the Herbert Kurz President’s Student Support Fund is now a source of special funds for the growing number of students who need assistance. Fifty clubs provide social and cultural experience for students with a wide range of interests. Community service and civic engagement are hallmarks of these organizations. Thanks to a $500,000 Community School Grant, RCC established Life Happens: 211-The Connection Center, designed to help students connect with whatever social services are needed to enable them to stay in college. Through the Center we learned that one of life’s basic needs, the need for food, is a critical issue. Two recent articles in national publications have noted that for significant numbers of college students, hunger and lack of food is a daily problem. RCC is seeking to meet student's needs by expanding the hours of operation of its food pantry and increase the volume of food available. The College community recently responded with two special programs for “food insecure” students. In December, the RCC Federation of Teachers, under the leadership of SUNY Distinguished Professor Bill Baker, provided complete holiday meals to 250 students. And recently, thanks to the generosity of many members of the College community, with special support from the RCCFT, a new program at the RCC Food Pantry provides students with vouchers for a hot meal at the Campus Café. Student Involvement, in collaboration with Culinart, developed an agreement to provide students with a complete, healthy lunch for $6. Student Involvement raised $1,319 from donations from members of the College community. The RCCFT agreed to match the funds, bringing the total to $3,957. 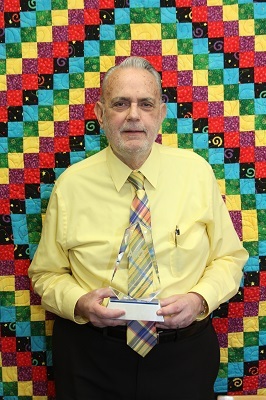 Professor Baker added $43 to make a grand total of $4,000, providing vouchers for 667 students. A special thank you to Tammy Collins-Richardson, Director of Student Involvement, for leading this initiative with special support from Sonny Reyes, Burton Louis-Charles and Edwin Gonzalez. A current student, who is also an alum, Roxanne Watson, earned degrees from RCC and Columbia University and returned to RCC to study Hospitality. She has also used RCC as a base to teach all of our students, faculty and staff to live by example. Thanks to her work for LiveOn New York, which promotes organ donation, RCC was honored, and we as a community Live by Example. 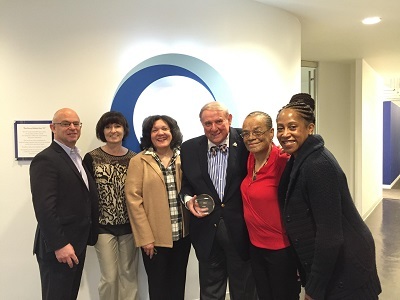 I was pleased to accept on behalf of RCC the LiveOn New York Making a Difference Award at a recent ceremony at their New York City office. LiveOn New York is responsible for obtaining and distributing organ donations for all New Yorkers. 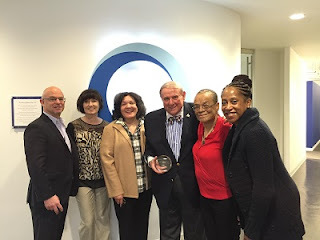 The award was given for the College's support of LiveOn New York's organ donor program. Currently, more than 3,800 RCC students are registered organ donors. The catalyst behind RCC's involvement is Roxanne Watson, one of the first graduates of the College's Honor's Program. Since becoming the recipient of a donor heart six years ago, she has committed herself to raising awareness of the importance of organ donations, both in New York and across the county. She recently represented LiveOn New York at NASCAR races in Dallas, TX. LiveOn New York also cited the amazing support of Wendy Gordon, Chair of Hospitality and Student Involvement administrators Tammy Collins-Richardson and Ann Gill.